HF: This picture shows the trademarks of Chuen Sun Knitting Factory, including Three Fives Brand, Seven Sevens Brand, under which knitted shirts, vests, shirts and sportswear were manufactured. The factory was first established by Chan Mo-chau and partners at O’Bailey Street in Macau. 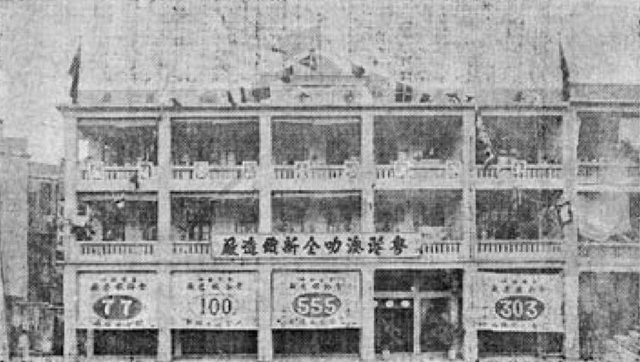 In 1934 the company set up a factory at 98-200 of Tung Choi Street of Mong Kok. Now, the owner is Mr. Ng Chi-ming (吳志明). ‘Hong Kong Chuen Sun Knitting Factory, manufacturer of the 555 Brand cotton undershirt, would like to respectfully inform our dear customers from Malaysia, Singapore, Taiwan, China, Hong Kong and Macao that due to this environmentally-friendly era, our factory can no longer continue production in the traditional, unique way. To preserve our reputation, we are forced to cease production. We are sincerely grateful to all our customers for their support over the past ninety years. Manufacturing was ceased in June 2018 and our stock is sold out. Thank you. ‘Hong Kong Chuen Sun Knitting Factory retains the ownership to the 555 cotton undershirt brand (made in Hong Kong). Please do not buy counterfeit products that are not made in Hong Kong. We have not asked any overseas agents to continue selling 555 Brand cotton undershirt products. I was informed that products are still available from the factory or from Yue Hwa Chinese Products Emporium in Yau Ma Tei.